Homeowners expect residential well pumps to keep up with everyday household water demands. But the endless loads of laundry, daily showers and regular dishwasher cycles often result in lower or inconsistent water pressure. The advent of constant pressure systems in the residential market in recent years has largely alleviated homeowners’ water woes. These systems operate with a home’s well pump and a variable frequency drive controller to automatically monitor household water demand. The variable speed technology adjusts the speed of the pump to supply water as needed without any pressure fluctuations. The result is consistent water pressure — even when multiple water sources are operating at the same time. Today, wireless monitoring technologies are further extending the performance and reliability of residential constant pressure systems. Mobile and remote offerings especially have become valuable tools, providing peace of mind to homeowners. Although mobile monitoring is not a new concept for commercial and industrial grade pumps, the technology has only recently infiltrated the residential market. 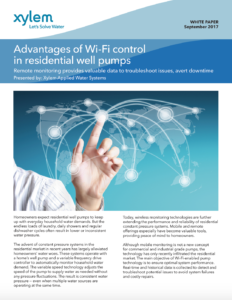 The main objective of Wi-Fi-enabled pump technology is to ensure optimal system performance. Real-time and historical data is collected to detect and troubleshoot potential issues to avoid system failures and costly repairs. Mobile apps like Xylem Inc.’s AqWiFi act as a dedicated resource to provide remote monitoring of residential groundwater pumps and variable frequency drives (VFDs), such as Xylem brand CentriPro’s Aquavar SOLO 2. Using Wi-Fi connectivity, the app links the VFD to a laptop or a mobile device like a smartphone or tablet. Once connected, end users can wirelessly monitor the system’s performance and view the pump and motor status, as well as fault notification and history. End users can also view trends of critical parameters such as motor speed, motor current draw and input voltage. Greater accessibility: Residential well pumps and VFDs with wireless capability enable end users to monitor the equipment from a range of standard Wi-Fi-enabled devices anytime, anywhere. All of the pump’s data and settings can be accessed through the AqWiFi app installed on a mobile device or computer. Better pump protection: The ability to monitor key system data in real time and access to fault history and system trends provides enhanced troubleshooting capabilities. End users can review the collected data, which may alert them to possible issues before damage is done to the well pump or the VFD. Peace of mind: The ability to monitor residential well pumps and VFDs for system irregularities allows issues to be rectified quickly, minimizing downtime. Homeowners rely on a consistent supply of water — even a few hours without it is a major inconvenience. Applying remote monitoring technology to residential well pumps helps keep equipment running smoothly — one less thing to worry about in busy households. About the author: Chris Preston is a residential water product manager with expertise in submersible and jet pumps and residential pumping systems. For more than 10 years, he has worked for Xylem Inc. and its Goulds Water Technology brand as a product design engineer and project manager on multiple global new product development projects. Preston holds a bachelor of science degree in mechanical engineering from Clarkson University.